There’s a fascinating article by Sue Neall on sewing a 6-piece wardrobe in a weekend. The Vogue 2910 Adri pattern is oop but still available. Sue Neall is an expert sewer. Look at that pattern : sheer fabrics, double welt seams, top stitching, lined bias cut top and skirt, skirt also has side-seam zip and shaped hem, pants with darts, curved pockets, zip and waistband. How did she do it all ? Whew, I get flustered just thinking about it ! Are there pattern possibilities and sewing processes which might make a weekend wardrobe an achievable aim for the rest of us – even for people who don’t sew knits and haven’t got a serger/ overlocker. . . ? There are many patterns labelled Very Easy which are not also Super Quick. Although the processes are easy they’re not fast, for example simple collars. Or there are a lot of processes, such as an eight-gored skirt. For speedy sewing, most of us need patterns with a small number of easy processes. Something like Park Bench Central Park (quick to sew, but sizing only for people with some experience). Another problem with patterns that are both quick and easy is they’re usually straight up and down, and about half of us aren’t. Styles which are straight up and down are only flattering for those of us who are straight up and down. And this is related to speedy sewing. You don’t have to be full busted for it to be well worth taking the time needed to add bust darts to most of these patterns. And do some side seam shaping : curving in for a waist or flaring out for larger hips. Moving the pattern side seam by 1/2 inch changes the garment by 2 inches or 1 size. Moving the pattern side seam by 1 inch changes the garment by 4 inches or 2 sizes. – pears/ triangles : need shoulder pads to balance shoulders to hips. – inverted triangle : rectangles make hips look as wide as shoulders. – hourglass : rectangles hide best feature – small waist. Nancy Nix-Rice uses the ‘Vogue’ body shapes of inverted triangle, triangle, rectangle, and hourglass. She doesn’t separate people who are rectangular (straight up and down) from round (waist larger than bust). ‘The Triumph of Individual Style’ does. They suggest round / apple shape people need soft curved shoulder shapes rather than square ones. Big shoulders may not be fashionable these days, but fitted shoulders are. Happily so are cut-on and raglan sleeves, which have a softer effect. And are quicker to sew. Smaller above the waist, larger below. If you have a clearly indented waist, also look at Hourglass advice. For a pear, a rectangle shaped garment big enough to go over the hips is huge at the top. That’s why shoulder pads are recommended, to stop all that spare fabric from sagging. Not a good starting point. I prefer flare at the side seams, from shoulder or underarm. Vogue styling advice for pears usually suggests shoulder emphasis and a neat waist with full skirt. And these are not quick techniques. 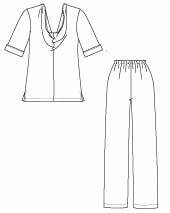 Easiest to start from a-line or flared patterns. Or perhaps ones with a bit of gathering, though that’s not a super quick technique. There are surprisingly few of these patterns, considering how many there are of us with this shape. One possibility is oop VE Vogue 8371. Those ‘handkerchief’ corners would look very droopy on me, but easy enough to cut them off. Make a larger size and add a front opening to the sleeved version, for a jacket. Change the length of top and skirt for more current proportions. An equivalent is See & Sew Butterick 5203 (add a skirt), or Vogue 8542 for knits. There are of course other a-line and flared patterns. I chose V8371 to show some of the extra steps you may need when there is not a wide choice of suitable quick patterns. Being small busted, I look better with an interesting neckline/ front. VE Vogue 8482 with an easy drape neck is a possibility (flare the side seams). This is an example of what keeps coming up – those of us who are not rectangular may have to do some pattern altering or change style features to get flattering patterns. Larger above the waist, slimmer below. It’s helpful to separate people who have large cup size but narrow shoulders, from people with wide shoulders but a small cup, and people with both large. Big shoulders – taper a rectangle. Big in front – well worth the effort to do an FBA, or at least add bust darts. For people with bigger shoulders, there are Very Easy patterns which assert the shoulder emphasis with a strong horizontal line. Such as VE Vogue 8552. (possibly remove zip and centre back seam). Inverted Triangle is the body type that’s most likely to have difficulty getting into a more fitted design without an opening. See my post on size. You may be surprised by what you can get over your shoulders or bust without needing a zip. If so, you can also leave out the centre back seam. But you are more likely to need a zip or other opening in a more fitted design. In that case, for a quickly made pullover style you might prefer drop shouldered loose fitting rectangles, like Anything But Ordinary by Louise Cutting. Balanced above and below a clearly indented waist. What a pity to waste a good figure by not adding bust darts. Nearly all patterns from the big companies have at least a little side-seam waist shaping, so increase it. Sadly, belting a rectangle garment gives what Nancy Nix-Rice (“Looking Good Live” DVD) calls the ‘sausage effect’ – fabric bulging above and below the belt. 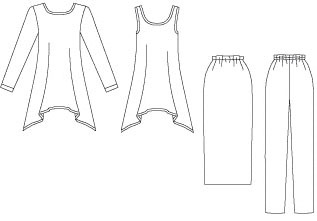 There are Very Easy patterns with simple princess seaming combined with cut on sleeves. Not so much extra work after the fitting is done. Perhaps VE Vogue 8512. Again see my post on size. You may be surprised how much you can narrow the waist and still get it over your head without a zip. Or add fish eye darts at waist level. But make sure they don’t make the waist area too small to get your shoulders through. Best to add bust darts as well, or you may get odd fabric strain lines. Princess seams are probably much less work once the fitting is done ! It’s not very flattering for people with an indented waist to wear styles without side seams. For us non-rectangles, it’s adding shape which takes the pattern adjusting and sewing time. Unless we just use fabrics which fall into place to show our curves : knit fabrics, soft fabrics with little body, or cut on the bias. Sadly, tapering or flaring the side seam gives a curved hem, which is much slower to sew than a straight one ! – fitting work : add darts, change side seam shape, adjust lengths. 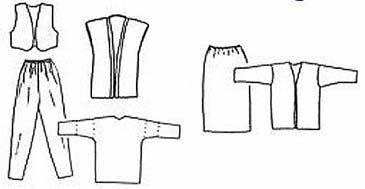 – adapting suitable patterns : change necklines, add or remove openings, etc. Or use very oversized ’boutique’ style patterns, as in the Shapes pattern line. These envelop all body shapes, but are not to everyone’s taste. Sue Neall, who sewed the 6 item wardrobe in a weekend, did her pattern altering as part of her weekend. But the only pattern adjustment she made was an FBA. For us less expert more oddly shaped sewers, there isn’t time in one speedy weekend for basting, trying on, and fiddling with the fit. So it’s either use a TNT or make a muslin beforehand. So I think we less experienced sewers with less straightforward shapes should do our pattern preparation before the main weekend, as well as fabric preparation, collecting notions, and winding bobbins. So we just leave the cutting and sewing for the breakneck phase. Though admittedly even two express weekends, a cutting one and a sewing one, would be a super-challenge for most of us. . .
Apart from changing the side seam shape, most ways of improving things for us non-rectangles involve more sewing processes. So while there are Very Easy patterns for us, they’re nowhere near as quick to make. It is of course ridiculous for me to be writing about speed sewing, as I’m the world’s slowest sewer. On the other hand, perhaps that’s why it’s a topic that fascinates me so much. . .
I’m planning more posts, on speedy processes and specific patterns. This entry was posted on April 25, 2010 at 3:52 pm and is filed under body shape, fit of clothes, speedy sewing. You can subscribe via RSS 2.0 feed to this post's comments. Both comments and pings are currently closed. Ah you are so exactly right. If I must do speed sewing, I depend upon my TNT’s. Thanks for your comment Bev. TNTs are marvellous things, especially for those of us who need to alter our patterns. As usual an interesting post. I think the Vogue pattern I posted elsewhere, 8589 has relatively simple shapes but was suitable for curves, and also simple finishes with bound edges at neck and arm.. I think I would avoid princess seams and use darts for speed of cutting and simplicity. Darts add shape and are actually quick to sew if you use Nancy Zieman’s method: mark apex and snip legs in the seam allowance. Then, pull out a long thread from the needle. Take a few stitches to anchor and then stretch the thread to the apex mark (it forms a straight line). Sew along the thread. Very quick, hardly any marking. Thanks Elizabeth. Vogue 8589 does look good simple shapes for someone with a waist. Trouble is everything except the jacket includes a zip. So only weekend wardrobe sewing for the more expert I think. Excellent technique for darts. I’m planning a later post on speedy techniques, and will certainly include it.